Since it started, Paris' deliberately-subterranean Dement3d label has been one of the most interesting imprints in this growing scene. Releasing music from some of the biggest names of this new wave but preferring to keep its moves cloaked in shadows, the label is much like Polar Inertia themselves, the 'blurry techno entity' who have been Dement3d's biggest prize since the beginning. Barely-concealed information is available concerning who exactly is behind the fog-shrouded duo, but in many ways the mystery suits the music, in their case an entirely more dystopian interpretation of ideas drawn from early rave music. While taking inspiration from both 90s techno and classic science-fiction, Polar Inertia's sound is as modern as it gets, combining punishing hardness with a bleak, inward-looking psychological intensity, thickly layered atmospheres, extended compositions, and heavily conceptual releases. Aside from a few scattered tracks, the entire meat of their discography thus far has emerged on Dement3d, a decision that probably held them from greater renown for a time, but which has helped to build the dark mystique surrounding them. There is definitely a structure and somewhat of a formula to the records which so far have dropped a few scant clues as to some kind of story underlying the project. There's far more melody and emotion in Polar Inertia than in most modern techno, but it is all darkly crushed and forbidding, aligned with the end times philosophy and imagery used by the duo in their rare communications with the outside world. Kinematic Optics is the first release from the duo to break the previous three-track format, and it's also their most ambitious work yet. The final title track on the first part of the EP beholds a Terminator-esque narrative of nuclear holocaust and mankind being exterminated by runaway machines, a classic idea in sci-fi but one evocatively managed here and combined with detailed, ambient soundscapes that form one layer of the techno the group is more famous for. The ending of the story is uncertain, but seems apocalyptic, its mood openly contradictory and vaguely psychedelic as the voiceover announces the coming of the machines to finish off the remaining humans and then changes tone, instead embracing their fate in the 'vaginal world', presumably a metaphor for death. It's unremittingly dark stuff with high artistic pretensions, and is followed by the album-length ambient track 'Can We See Well Enough To Move', split in two parts across the two sides of the second EP. Like the impenetrable dust clouds described in the title track, this 40-minute long performance, taken from a live performance in Brussels, is barren, beautiful and alienating – the most abstract and challenging work yet to emerge from the duo and one that supports the bleak futurism of their other work. Slowly accruing both regular rhythmic motion and a brighter tone in its middle section, it uses the same uneasy contrast between moods as the short voiceover piece, suggesting a transition between states of being or a liberation from physical suffering found in dying. It's sonic content is similarly challenging, with textured carpets of noise and looping feedback layered over hovering ambient synthesiser pads and droning bass in a dense, sculptured web. Overdriven filters cause a shimmering effect, similar to the famous hallucinations of polar explorers caused by staring too long at blinding expanses of snow, and after building to a climax characterised by slowly rising pitches, it slowly evaporates into a silence somewhere between tranquil and solemn. 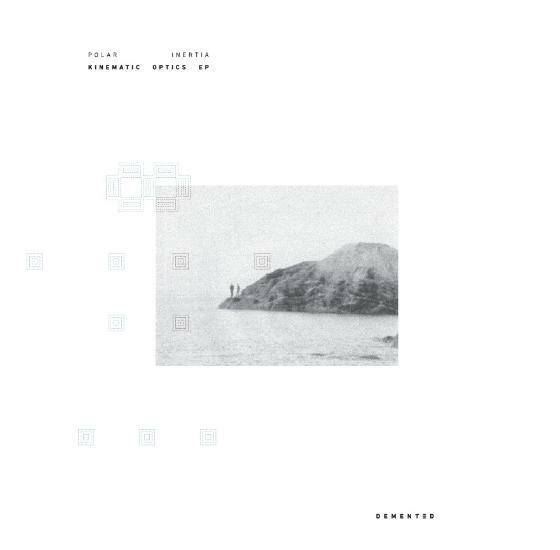 Compared to the boundary-pushing sonics and abstraction of the final three tracks, the first three extended techno pieces are more functional and concrete, but the techno Polar Inertia makes is interesting precisely because of the same extreme attention to sonic detail and moody, apocalyptic beauty that makes their ambient work stand on its own. The duo are masters at extended, turbulent tracks that routinely break the 10-minute mark and progress fluidly but with complex textures and compositions. 'Vertical Ice' is particularly beautiful and notable here, rising from an ambient opening steadily as single elements are slowly added until it accrues unstoppable momentum and an intense, epic mood. Cycling, panning tones and distorted vocals along with gradually loudening typewriter hi hats form the main drive, but the focus is on increasing density and layers while leaving the rhythm mostly static in a trance-like state. The two shorter A-side tracks are more thumping techno tracks, comparatively sparse in their construction, with 'Floating Away Fire' centred around a thickening blanket of reverb-saturated noise that gradually overwhelms most of the other elements, while 'Hell Frozen Over' is stripped and severe, with short bursts of keyboard melody escaping from underneath the heavy atmosphere and intense, deliberate development. At nearly 80 minutes long and playing like a single piece, Kinematic Optics is an album in all but name, and while the label and artists chose to present it as an EP due to the differing provenances of the two halves, the longer format and higher concept are a better fit for Polar Inertia's sound and ideas than their past EPs have been. It's also their most compelling work yet.